Download ActiveICM from www.molsoft.com/support . Please always check you are using the latest version. Save an ICM file (.icb) containing slides. Click here to see how to make slides. Click on the File tab, and then click Options menu. 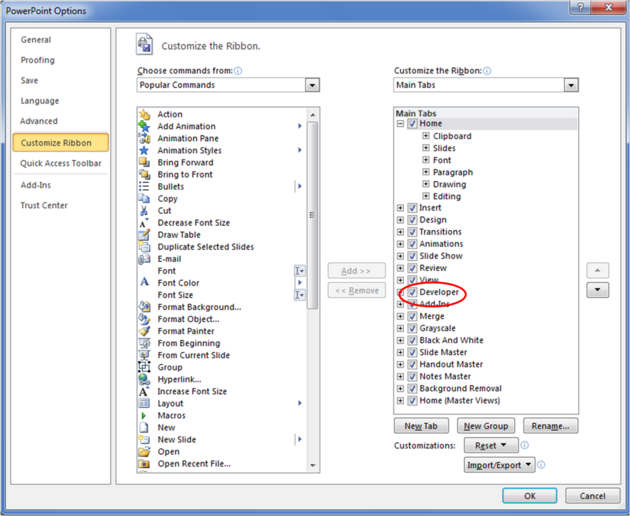 Select the Customize Ribbon option and then check the Developer option in the right hand side panel (see image below). Click on the Developer Menu. IMPORTANT! Click OK and then you will see the Developer Menu in the Ribbon at the top of PowerPoint. Select the More Controls button in the Controls field. Select ActiveICMCtl Class from the list of controls and click OK.
Click the mouse anywhere in the white PowerPoint space and a dialog box will be displayed asking you to select your ICM (.icb) file. Click and drag at the corners of the image to resize the normal way you would resize an object in PowerPoint.